What is convective panel heating? Convective panel heaters are a cost effective way to heat an area of your home, they are safe and environmentally friendly and because you can install them yourself, they are a quick and easy fix to heating up a room in your home. How does convective panel heating work? Convective panel heaters use a combination of natural convective currents and radiant heat; cool air is warmed by a unique heating element within the heater, the warm air rises and naturally circulates around the room. 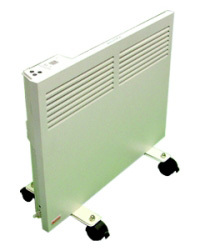 These heaters do not use fans or have any moving parts making them a quiet heating solution.